Truly the stuff of legend. Fine single malt Whisky had been produced in Wales for centuries. But then — inexplicably — all that stopped in 1894. Crazy right? Well, the Welsh Whisky Company was founded in 2004 to put an end to this tragic Welsh drought and bring the magic spirit back to the land of King Arthur. But they didn’t “just” start a new distillery, they decided to do it a bit differently. They contacted scientist Dr. David Faraday — grandson of the famous physicist — to design a special pot still that would yield a more pure distillate at a higher ABV. And this single, one-of-a-kind still has a full capacity of only one cask of spirit per day. We Whisky nerds think that’s cool as heck. Today, these fine blokes produce what they call “the smoothest Whisky on Earth” and they make a strong argument with their award-winning range of finished-wood Whiskies, Gin, Vodka and a Merlyn Welsh Cream Liqueur that will tickle your wizard’s hat. 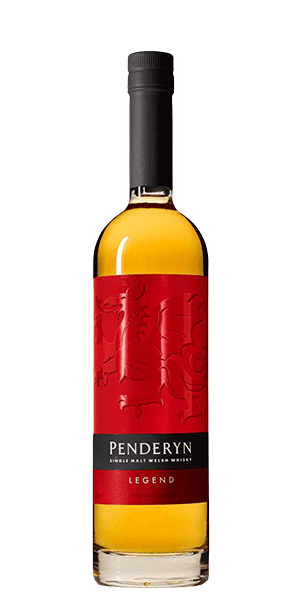 You just can’t talk about Penderyn Legend without mentioning the label — that big, bold Welsh Dragon reaches out from the bottle in blazing red. Long before Game of Thrones made dragons oh-so-chic and trendy again — we’ll just give you a minute to think about Emilia Clarke — the red dragon of Wales has symbolized leadership and victory. And that makes it a darn near perfect symbol for Penderyn Legend. Penderyn Legend is the younger sister to the core Penderyn Madeira Single Malt. It comes off the same still and is aged the same way — first in Bourbon barrels, then finished in Madeira Wine casks. The difference is that the Legend is a bit younger and is bottled at 41% ABV. This makes the Penderyn Legend milder and great as a daily drinker and to serve with food… while watching Emilia Clarke on Game of Thrones… we’re just say’in. What does Penderyn Legend taste like? The Flavor Spiral™ shows the most common flavors that you'll taste in Penderyn Legend and gives you a chance to have a taste of it before actually tasting it. One of my favourites. A great Whisky that's so like Scotch, but has an unintelligible note you can't find anywhere else. Smooth, very flavourful. The stuff of legend indeed. Absolutely handsome. Always have to have a bottle in the house for sharing with friends. Makes a fantastic tasting gift too!